"If there is a heaven, it's certain our animals are to be there. Their lives become so interwoven with our own, it would take more than an archangel to detangle them." The candle of your life burnt so brightly for such a short time, but the impact you made on my life was profound and permanent. I will look for you in the next life on the agility course doing tunnel. 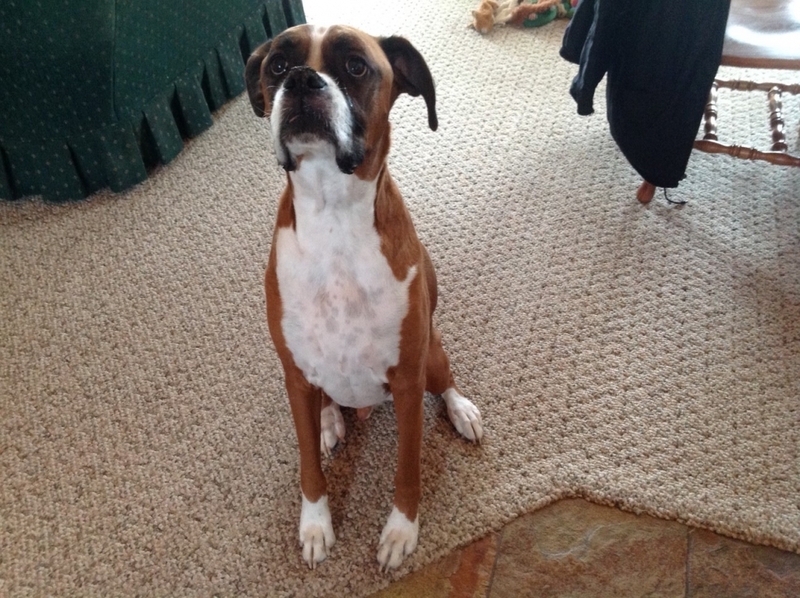 My family and I would like to thank the doctors and staff at Cedar Grove Veterinary Services for all they did for Ranger in his short time with us. We will always remember the care they showed. We will miss your happy go lucky attitude, and the love you provided to our family, friends, and neighbors. We were so blessed to have you in our lives. I want to also thank Dr. Getson and staff for the wonderful service provided to us and our beloved Madison. We will forever be grateful. We will love and remember you forever. You were such a good boy! A special thanks for the Cedar Grove Vet staff for their great service. great dog and companion for us during the short years he was here with us. You were a gentle and loving soul - everyone who met you adored you instantly. You had the heart of an angel and sadly, now you are with the angels. Thank you for blessing us with almost eleven years of your wonderful companionship. Thinking of you running down the shoreline chasing the waves will always make us smile! Please give Moe and Cecilia big kisses for us. We will miss you dearly - you couldn't have been loved more and will always be in our hearts. I know Mel is having fun on the other side of the bridge with Mavrick, Ashley and Dart You will be extremely missed but I know you are having much more fun now. I have to announce with a heavy heart that today I have lost a best friend. 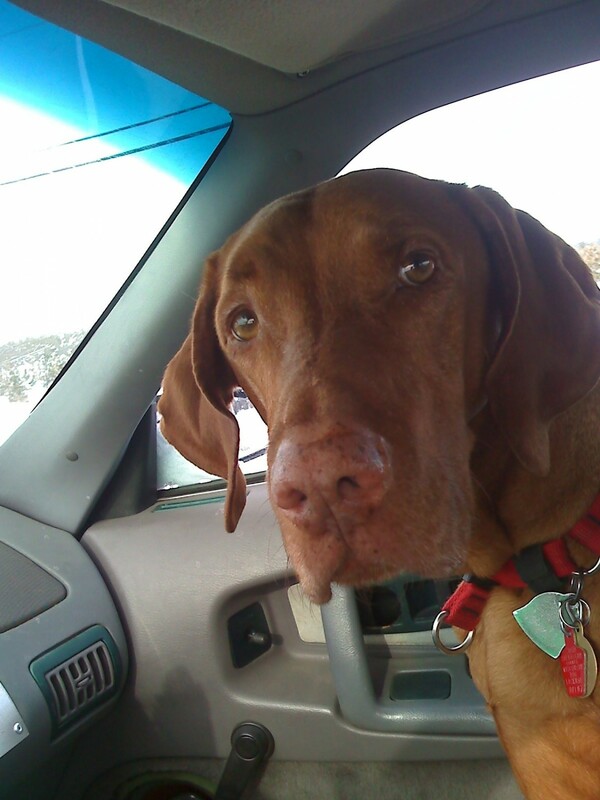 He was my dog, Rusty the Vizsla. He took the journey this morning across the Rainbow Bridge where he can be healthy, run, and play with other dogs. Hopefully, we’ll meet again someday. 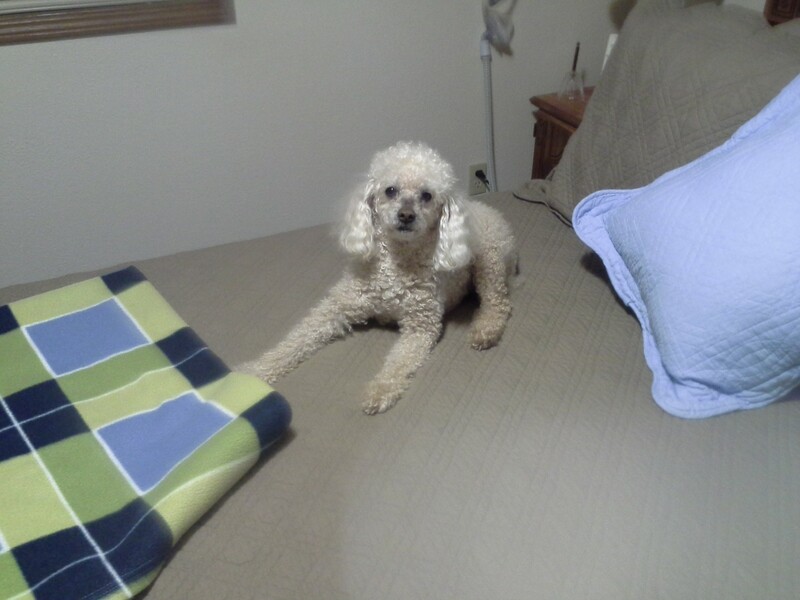 Rusty was born in the Houston, Texas area on February 2, 2003. He was purchased by a couple, who ended up moving to Charlotte, North Carolina. Just before he was a year old, the couple decided to give him up to my roommate who had been working on their house. 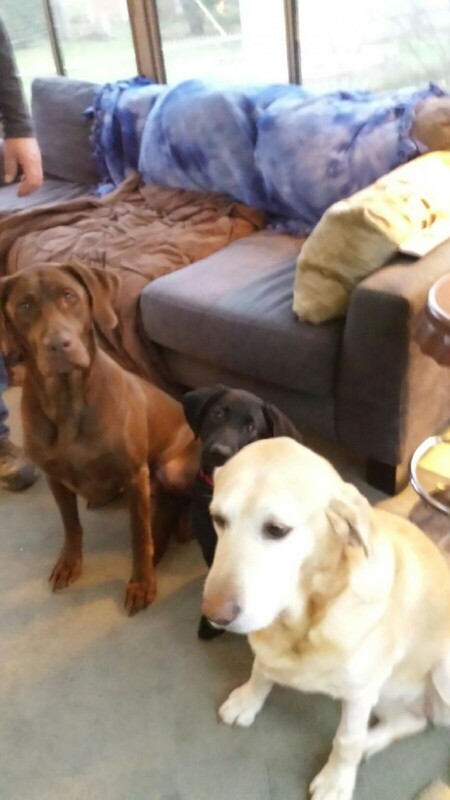 Apparently, the couple was not prepared for the ball of energy in which a male Vizsla has. I was not in a position to acquire a dog at the time. However, their loss was my gain, as my roommate couldn’t dedicate the time to manage Rusty either. 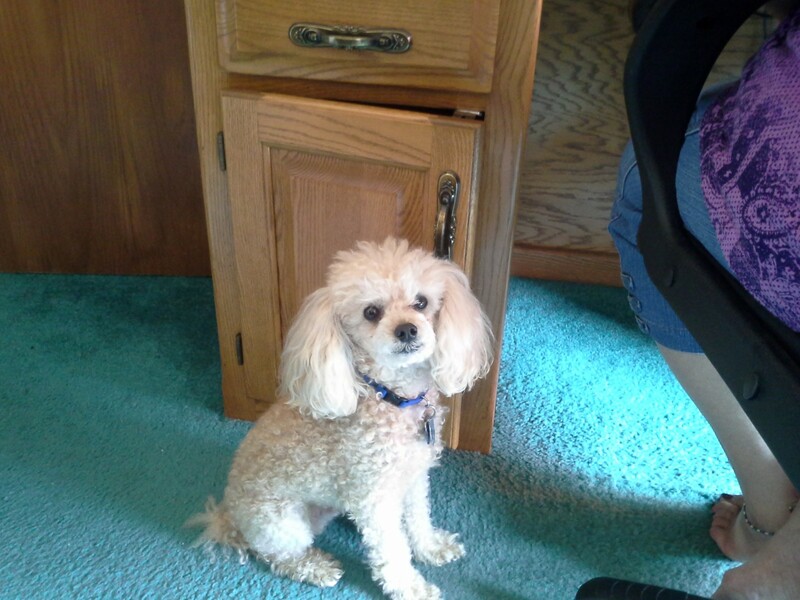 Rusty has been a part of my life since January of 2004. He was definitely a great companion to have, who surprisingly helped me in in rough times. We experienced a lot together, moved around the country, shared smiles, and tears together. We enjoyed taking walks along the beaches, through the woods, and fields along Lake Michigan. 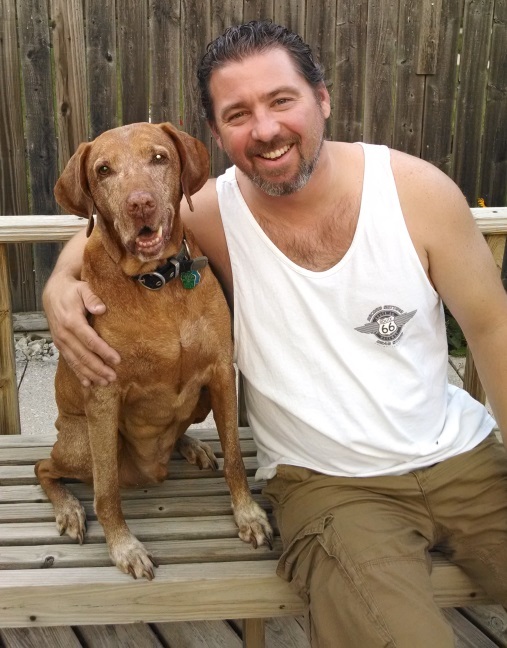 He was an extremely active dog who would even run alongside my friend Eric Sutton as he would roller blade in downtown Charlotte, NC, and stopping at some outdoor (dog friendly) bars for a cold beer. He would also go with the flow when my friend Karen Gordon dressed him up as a flower for Halloween and sent him out trick or treating with her daughter. My girlfriend Kelly Schwanke and I dressed him up as the Dark Knight Batman for a Halloween party in 2013. He wore it like a champ! He loved riding in my truck, being around kids, playing with other dogs, and being a gentle friend for some folks at nursing homes. Most of all, he was a people person. He gave lots of hugs, kisses, and lots of love. I know you shouldn’t give dogs people food; we shared a lot of meals and snacks. Some of his favorites were: Cheezits, pizza crust, bananas, apples, carrots, and in the last few years, craft beer. Yes, early on I put some Miller Lite in a dish and he wouldn’t touch it. Then one day while sitting outside, he knocked over my bottle of some expensive dark craft beer and began to lap it up. Since he was a high strung dog, I couldn’t exercise him enough, so I enrolled him in Central Bark Doggy Day Care. There he would attend a few times a week to burn off some energy and socialize with other dogs. Although, the staff at Central Bark, said he would stick to them like velcro and didn’t much care to play with the other dogs. He would always run and greet me when I come home from work, check on me in the morning to feed and let him out. He could be sassy and extremely vocal. He would bark and whine whenever opened a beer in a brown bottle. I never hunted with him; however he was a great pointer and stalker with small animals. When he would spend time with my dad, he would be pre-occupied for hours by hunting & flushing out chipmunks in the wood piles. He didn’t care much for being in the water, which was odd, but enjoyed sitting around a camp fire in his own chair. Some other notables about him; he was a registered AKC pure bred Vizsla, various awards at Central Bark, frequently attracted attention from curious people to compliment him or inquire about his breed. He would open his own Christmas presents, attended races at Road America, and always had a smile to light up a room. In the last year and a half, his health took some turns, which kept compounding to the events that took place in the last 24 hours. He was beginning to struggle more and more. I felt it was time, and I would rather miss him than see my friend struggle. You were a one of a kind soul- always forgiving heart and relentless spirit. You always found a way to make someone smile. 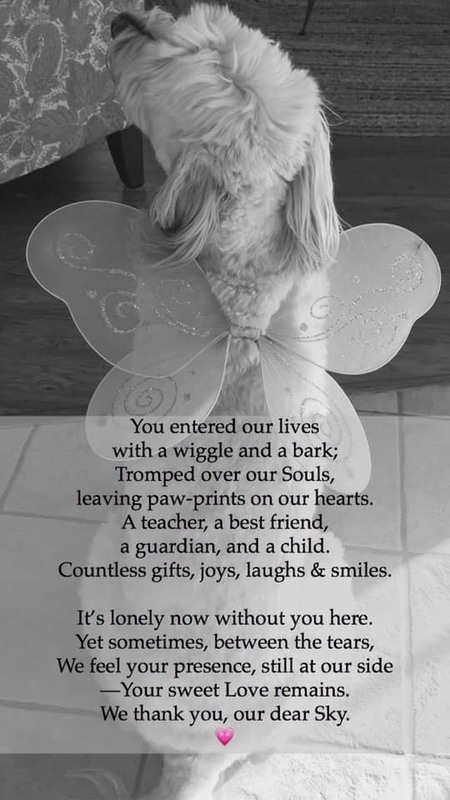 We’ll never forget how you greeted someone at the door with toys in your mouth, your tail wagging as fast as it could go, and how you sang to the person. We know you found a big lake in heaven to swim in all day. We miss you dearly. We love you and you’ll be in our hearts forever. Stewart we will love and miss you forever!! 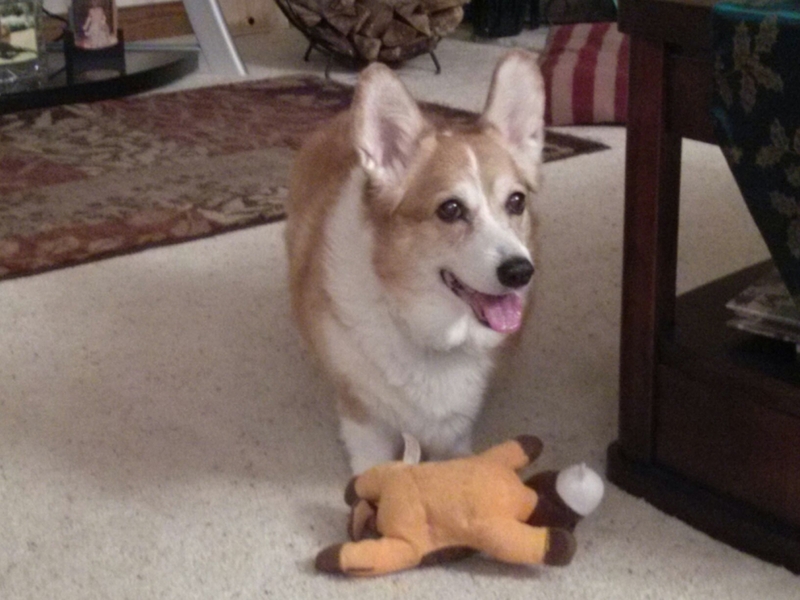 You were our furbaby and a wonderful pet to our family! You had your own little attitude like no other. Your brother Stanley is missing you and always looking for you! RIP Stewart! Mommy, Daddy, and Stanley miss and love you to the moon and back! You will forever be in our hearts! moon and back! You will forever be in our hearts! We were blessed to have our dear ‘Ebs’ as long as we did. 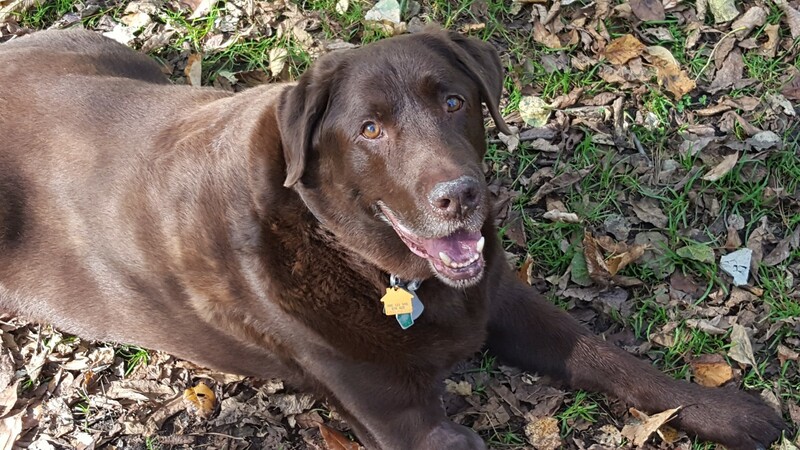 She was such a good girl and a wonderful part of our family. 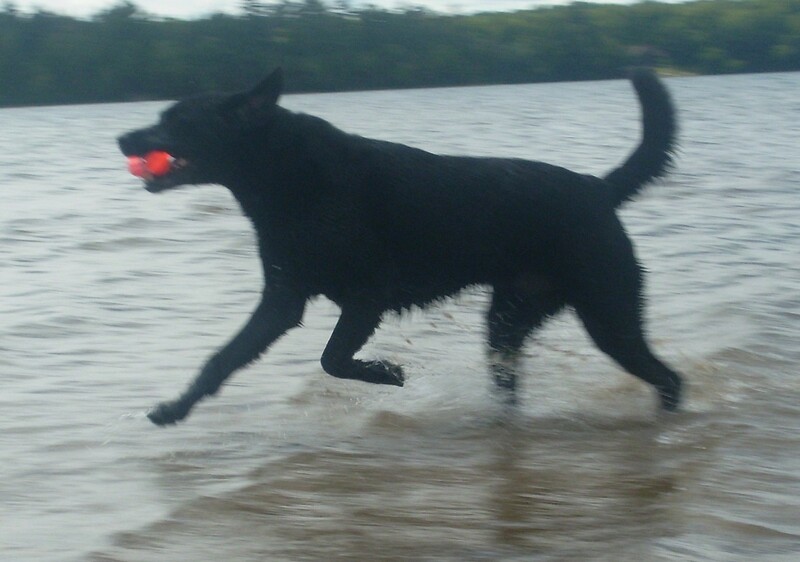 She always loved to play ball, after all she was part golden retriever! She loved to be outside and was always ready to go for a walk! Ebs always wanted to be wherever we happened to be, especially if toast or spaghetti were on the menu! Ebs, we know you’re on the other side of ‘The Bridge’ until we meet again. We will always love you and miss you. 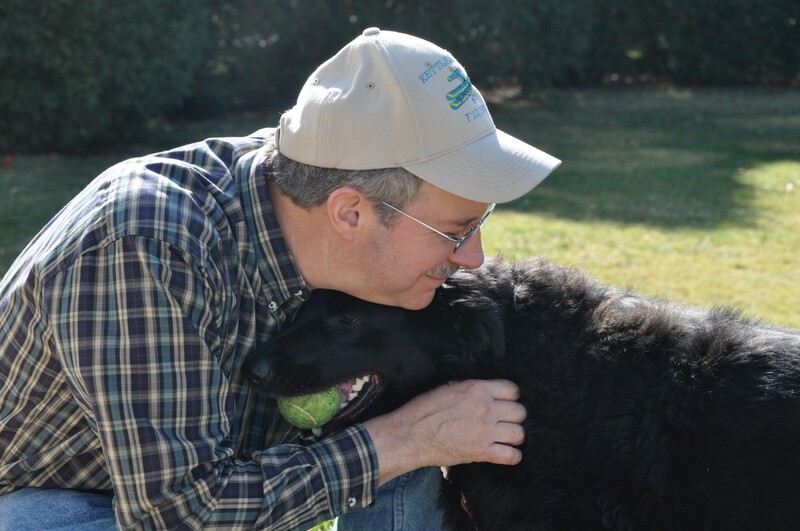 Boomer was my dad’s best friend for the last seven years. They went everywhere together. Boomer’s favorite part of the day was his walk in the woods with my dad. He was such a calm and serene dog that loved to be a companion. We encourage our clients to share special photos or memories of their beloved pets. 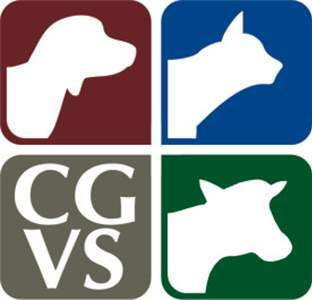 Please submit any pictures and / or text to photos@cgvet.com and we will create a special dedication for you and your friend.